The British Gazette » The REAL threat: The time difference! Above, part of Martin Waldseemüller’s Carta Marina of 1516. In creating the “Carta Marina”, Martin Waldseemüller sought to present the most up–to–date conception of the world at that time. Equal in size to his 1507 map, the Carta Marina is markedly superior to the earlier map in artistic detail, possibly reflecting the hand of the artist Albrecht Dürer (1471–1528). It incorporates greatly expanded and corrected geographical information. 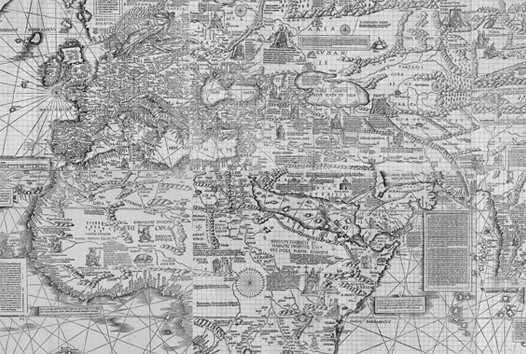 The Carta Marina could be considered the first printed nautical map of the entire world. However, in part because of the controversies surrounding his earlier naming of the Western Hemisphere “America,” Waldseemüller omits the word from the Carta Marina, and indicates that North America is joined with Asia. In our recent article about the Olympics (http://www.british-gazette.co.uk/2016/08/22/the-rio-olympics-2016-getting-what-we-paid-for/) we opined about the difference in the time zones – between the UK’s and wherever in the world the IOC decide the Olympics should be held. Let us face it: Having the games held in Brazil was an inconvenience. For us of course, not the Brazilians! Having the games in Tokyo is also going to prove inconvenient however our sportsmen and sportswomen competing on the water won’t have to face the unpleasant hazard of floating sewage! When our sports-people were faced with most unpleasant deposits on the blades of their oars, they will have been reminded how different world is beyond the confines of Portland Marina! Today in modern Britain the sight of “you know what” floating down a river will bring forth complaints and action from the authorities. Our ancestors – 500 years ago – in 1516 would have given such “you know what” scant attention. That, of course is to miss the point. Which of course is something they do often and are very good at! In yesterday’s article (http://www.british-gazette.co.uk/2016/08/24/the-approaching-storm/) we drew the reader’s attention to the controversy surrounding an article worn by some Muslim women, the “burkini”. This controversy demonstrates what can be called a clash of cultures. The reason why the French authorities are taking a stance that many will regard as illiberal and authoritarian is that they perceive the “live and let live” approach does not work. You see, the problem with the conservative Muslim female dress codes is NOT the wearing of these garments by the Muslim women, it is the reaction of some – not all by any means – of some Muslims to those women NOT wearing such garments! “Bigot!, Islamophobe!, Racist! I’m going to report this website to Devon and Cornwall Police!” we hear the politically correct shout and scream. But before they do they ought to consider something. How would their ancestors in 1516 have reacted to an atheist who wrote that a belief in God was delusional and the idea that Jesus of Nazareth coming back to life three days after being crucified to death was ridiculous? For certain, such an individual would have been executed. Furthermore it has to be said that the means of their execution would be far more horrific than being thrown off the top of a tall building, which is the way IS prefer to deal with men who describe themselves as Gay. The REAL danger we face in the not too far distant future is that of scientific advancement. Back in 1516 the primitive technology of the time limited the destructive capacities of our ancestors – who could give a Master-class on “Zero Tolerance!” Advances in biotechnology will make it possible for this technology to be “weaponised”. It is one thing to be able to make agreements with states along the lines of the present agreements on nuclear weapons, but terrorist groups bent on mass destruction will not be subject to such. The horrible truth is this: as technology – across the spectrum – develops, the danger from those possessing a mindset suited to the era of the “Wars of the Roses” and not the Brighton of 2016 increases. Of course, were the Editor himself to state that under proper regulations, say after obtaining the permission of a court, such “human re-engineering” should be permitted will ensure that he too suffers the fate described above. This of course will be addition to begin incessantly ranted at by the late and most unlamented Adolf Hitler for having Jewish friends!